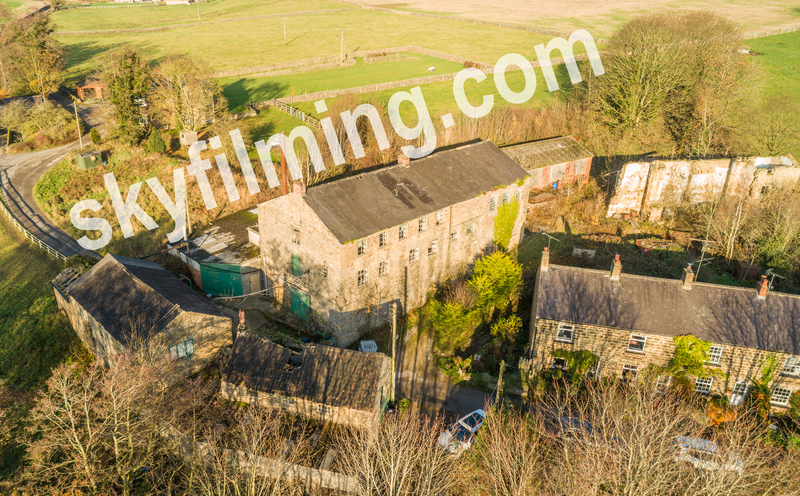 Occasionally, a lot less than you might imagine for an aerial photography company, we get asked to capture some images of large houses and interesting developments of old buildings such as this historic mill near Harrogate in North Yorkshire. Most of our drone and video production work is either for the TV, corporate or construction industry, so it’s a nice change of pace sometimes to visit beautiful old buildings, or in this case nice buildings fallen into disrepair that are to be rescued, renovated and brought a new lease of life. This old mill building sits at the end of the long lane and has a little river next to it and a quaint little row of mill workers’ cottages. The location, hemmed in by the cottages, a hill, river and trees, makes it difficult to get an appealing photograph from the ground that really shows off the extent of the main building and its outbuildings, so using one of our drones to capture a series of aerial photographs, some 360 panoramic property images and a few video clips from the air made perfect sense.